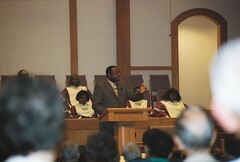 Here is another photo of new Baptist World Alliance leader Neville Callam during his recent visit to Missouri. For more about it, see last week's photo, and recent column entitled "It's a Small World." Also, the BWA has a page with a lot photos from the national tour, including a couple of mine.